A new walk in bath tub makes the perfect bathroom addition for Gainesville, Georgia, homeowners who are looking for a safer and more comfortable bathing experience. Walk in tubs are known for their low entrance barriers that are just a couple of inches high and for their depth, which is twice that of ordinary tubs, allowing for built-in seating to be at the optimum height for comfort. All of these features can help reduce anyone’s fear of slipping or falling while getting in and out of the tub. Walk in tubs also benefit individuals who struggle with limited mobility or pain. Often, those who need assistance to bathe in standard bathtubs find that walk in tubs give them the confidence they need to bathe independently once again. A walk in tub offers even more benefits when upgraded to a therapeutic tub. There are multiple therapy tub options to choose from, including aromatherapy tubs, hydrotherapy tubs, and chromatherapy (light therapy) tubs, which provide the ultimate relaxation and can help reduce stress and anxiety. Sometimes therapy tubs are even used to provide temporary alleviation of pain or discomfort that accompanies a wide range of medical conditions. For instance, the massaging jets of hydrotherapy tubs could be used to target back pain or arthritic joints. While therapy tubs aren’t cures for these issues, they can certainly provide some temporary relief. 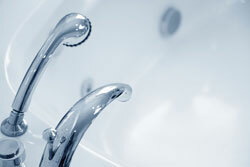 To learn more about our walk in bath tub products, please contact us today. We will be happy to provide a free price estimate for installation at your Gainesville, GA, home.